Winterizing (= pickling) your ro (reverse osmosis) watermaker is a job that comes to the most of us each year, after our cruising season. It has done a great job for us, supplying us with all the water we needed, and now it's time to put it into wintermode. As a rule, if you're planning to not use it for more than 6 weeks, then it's better to winterize it. This is called a long term shutdown of your desalinator. I you will use it in that time span, you have to make sure that it runs minimum once a week. Once winterized, your system is good for 6 to 8 months, if in perfect conditions. This means, you cannot have a leak in which the storage chemical drips away, you need cool temperatures and it helps when your system was clean before the winterizing. Newer membranes prolong the winterization too. Okay then, what do you need? 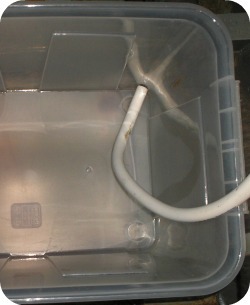 A large plastic container, a long term membrane storage liquid and a suitable piece of hose with connection. The storage liquid is a non-oxidising biocide. Depending on your manufacturer's recommendations, you know how large the plastic container needs to be. I use one that can hold about 40 liters (= 10 us gallons). 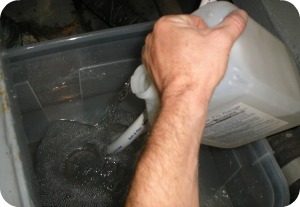 When you winterize your ro watermaker, make sure that there's enough product water in your fresh water tank. With product water I mean the water that is produced by your system. This water is definitely of good quality and thus, we will use this water. With water from the dock, you never know. Companies responsable for the water supply of a town or city, do use certain chemicals in the water and some might hurt the membranes. Chlorine, for example, will do permanent damage to the membranes. Watermaker manufacturers recommend you use chlorine-free water, and for the best results calcium-carbonate free. Now, the only way to be sure that you're using the right water, is the water coming from your system. 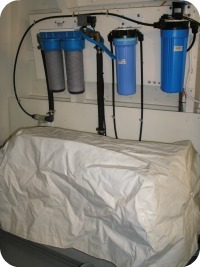 Another option is to add a charcoal filter between your fresh water tank and the flushing system of your desalinator. This filter takes all traces of chlorine out of the water. First of all, replace all your filters. Don't winterize your system with dirty and old filters! To see how to do it and other maintenance jobs, click here. 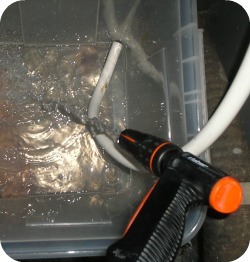 Close the seacock and disconnect the hose from the seawater strainer. Connect that hose with our extra piece of hose. This is to make our suction line a bit longer, so that we can reach the plastic container. fill it with water from your fresh water tank. Fill it until the top and then stop. Because you're likely to be in a yacht marina when you do the winterizing, it's not a good idea to draw in seawater from the yacht marine. There's often dirt, soap, fuel and other chemicals that are floating around in the water. The aim of this step is that we want to flush the whole system with good quality fresh water and this for a minimum of 5 minutes. 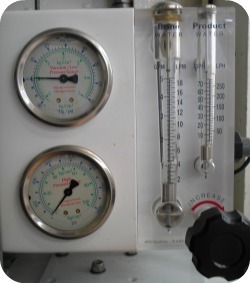 When doing this, we can turn the back pressure regulator clockwise until we reach about 200 psi. This ensures that the product water line inside the membranes stays wet. Take the pressure off again, by turning it counter clockwise, and stop the whole set. Okay, that was the preparation. There's only fresh and clean water in the system now. Fill the plastic container again with water from our water tanks until the top. This time we add the recommended long term membrane storage chemical. Make sure it's mixed well with the water. Note: If your boat is in a cold climate and you're expecting freezing temperatures (only in this case! ), than you have to protect your watermaker. Put an extra 8 to 15 liters (2-4 us gallon) of foodgrade glycerin (= propyleen glycol) in the plastic container with the mixture. Turn the system back on and let the suction line start drawing water from our plastic container. Once almost half of the water in our container is gone, stop the desalinator. 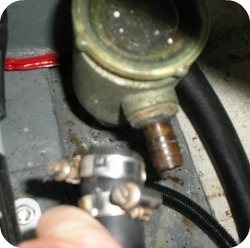 Now, we are sure that there's only water, with the winterizing chemical, inside our watermaker. At this moment, we need to disconnect the brine discharge line. This is the hose that takes the rejected water overboard. Once disconnected, divert it to our plastic container, so that we have created a loop in which the water with the chemical can circulate. Start the system and let it run like that for 30 minutes. Don't do anything with the back pressure regulating valve. Leave the system unpressurized. 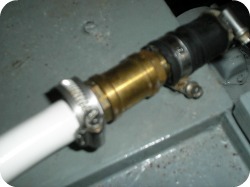 After half an hour, stop the desalinator and connect the brine discharge hose to the through-hull fitting that takes the rejected water overboard. Start the system again, so that you remove the rest of the water in the plastic container. Just before all water is sucked up, stop your ro watermaker. Connect the suction line back to the seawater strainer. Switch off the electrical supply for the watermaker and put some tape over it to remind you and everybody else that the system is winterized. As an extra measure, I place a cover over the watermaker. Once the winter period is over, you just go out with the boat, in clean waters, and you start your watermaker, unpressurized. 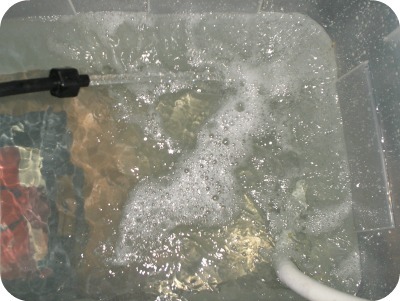 The winterization product goes overboard and normal seawater flushes the system. Run it like that for at least 10 minutes. Longer is better. After that, you're clear to pressurize the system and start making water!